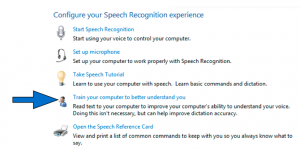 Windows 7 includes a speech recognition feature you can use to control your computer and even dictate entire documents. 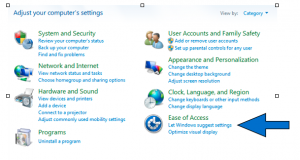 This feature is found in the Ease of Access Center of the Control Panel. 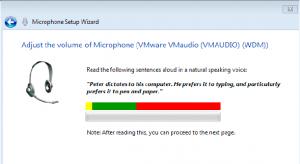 In the Ease of Access Center, choose Set up microphone under Speech Recognition. 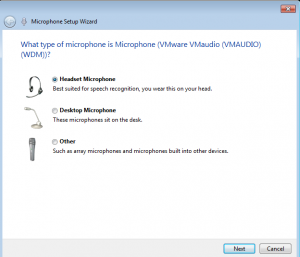 Select the type of microphone you plan to use with Speech Recognition, then choose Next. Choose Next again. You should see a screen where you can check the microphoneʼs input level by reading some text. When youʼre done checking the levels, choose Next, then Finish. 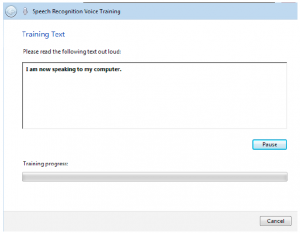 You will read a series of screens to train the Speech Recognition feature. This process should take about 5-10 minutes. When youʼre finished, choose Next, then Donʼt Send. Taking the time to train the Speech Recognition feature will improve how well this feature will work with your voice and is highly recommended.